Trump Talks Tough On Trade At Summit In Vietnam : The Two-Way In a speech that sounded at times like an airing of economic grievances, the president told APEC member nations that the U.S. will no longer tolerate unfair trade practices. 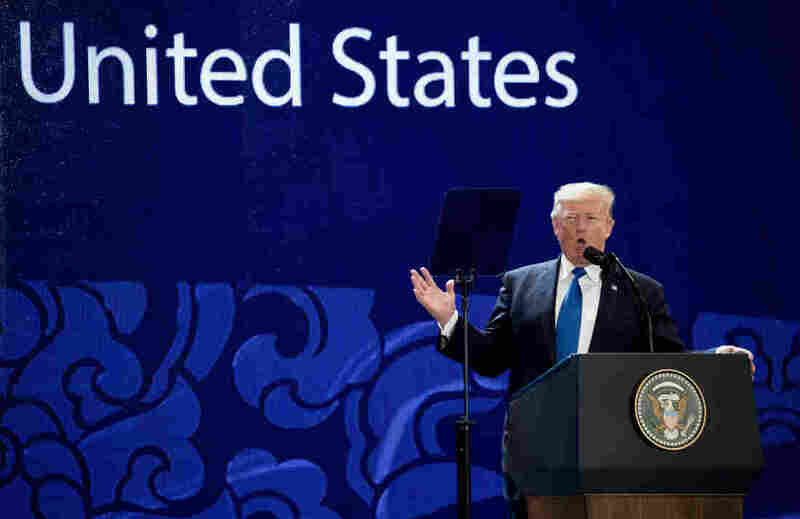 President Trump speaks at the Asia-Pacific Economic Cooperation (APEC) CEO Summit at the Aryana Convention Center, on Friday in Danang, Vietnam. President Trump — in the harshest language on trade so far on his five-nation tour of Asia — told a regional summit in Vietnam that his administration "will not tolerate" continued trade abuses and that countries must "follow the rules" if they want to do business with the U.S. The president's speech at the Asia-Pacific Economic Cooperation (APEC) CEO Summit in Danang sounded at times less like a vision for the region than an airing of economic grievances. "The United States will no longer turn a blind eye to violations, cheating, or economic aggression. Those days are over," he told representatives of the 21-member grouping. Danang is the coastal city where the first U.S. combat troops landed in 1965, marking a major escalation in the Vietnam War. Trump alluded to the war, which claimed more than 57,000 Americans and as many as 2 million Vietnamese: "This city was once home to an American military base, in a country where many Americans and Vietnamese lost their lives in a very bloody war. Today, we are no longer enemies — we are friends." But, as NPR's Scott Horsley, who is traveling with the president, reports, "Even as he cheered the success that countries like Vietnam have had in pulling their people out of poverty, Trump complained some of that success has come at the expense of the United States." In one of Trump's first acts as president, he withdrew from the Trans-Pacific Partnership, or TPP, trade agreement, labeling it unfair to the U.S. and vowing instead to strike a series of bilateral deals with the 11 other nations that remain in the pact. As we reported earlier, on the president's previous stop in China, Chinese leader Xi Jinping agreed to some measures to address the gaping trade deficit with the United States, but did not address Trump's broader trade complaints. The president has sounded his dual themes of fair trade and regional security — particularly as it applies to containing North Korea — since beginning his tour earlier this week, with stops not only in China, but in Japan and South Korea. Those three countries are represented at APEC, as are many others in Southeast Asia, and the Pacific Rim. In his visit to China, Trump put roughly equal emphasis on the two themes, but at APEC, trade was the stronger motif. "We are not going to let the United States be taken advantage of anymore," the president told APEC representatives. "I am always going to put America first, the same way that I expect all of you in this room to put your countries first." "We lowered or ended tariffs, reduced trade barriers and allowed foreign goods to flow freely into our country," he said. "But while we lowered market barriers, other countries didn't open their markets to us." That remark elicited a barely audible reaction from someone in the audience, which Trump picked up on: "Funny," the president remarked to scattered clapping. "They must have been one of the beneficiaries." In the manner of his campaign-style rallies, Trump pointed to the source of the disturbance: "What country do you come from sir?" but got no response and moved on with his speech. Russia is an APEC member and there had been the question of whether Trump would meet one-on-one with Russian President Vladimir Putin, but just ahead of Air Force One's arrival in Vietnam, White House press secretary Sarah Sanders seemingly quashed the speculation: "There was never a meeting confirmed and there will not be one that takes place, due to scheduling conflicts on both sides." But soon afterward, a Kremlin spokesman said the two leaders would meet on the sidelines of APEC "one way or another." In July, the two leaders held a "brief conversation" on the sidelines of the G-20 summit in Hamburg, Germany, with Trump foregoing an interpreter. That discussion was not initially disclosed by the White House. The president has one final stop on his tour in the Philippines before heading back to the U.S.